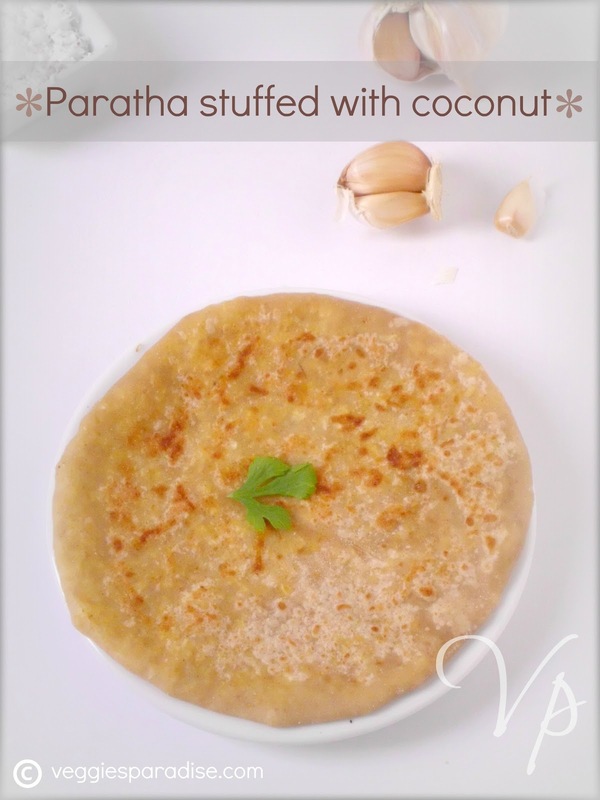 Stuffed Paratha with coconut - Tired of making korma's or other side dishes for your chapathi's, then here comes a delicious and easy stuffing for your paratha's. Very simple to prepare, as it needs only 4 ingredients, coconut, sambar powder, garlic and salt. With the quantity I have mentioned below , you can make about 2 - 3 stuffed paratha's. In a bowl, add the grated coconut,sambar powder, crushed garlic, salt and mix well. Take one lemon sized chapathi ball, dust it in flour and roll them into a flat and round shaped one. Place the coconut stuff in the centre and close it well .Dust in the flour and roll them once again to form a round shaped paratha. fine blend of flavours in the paratha- good one ! Lovely paratha. Coconut and Sambar powder should try that combo !! 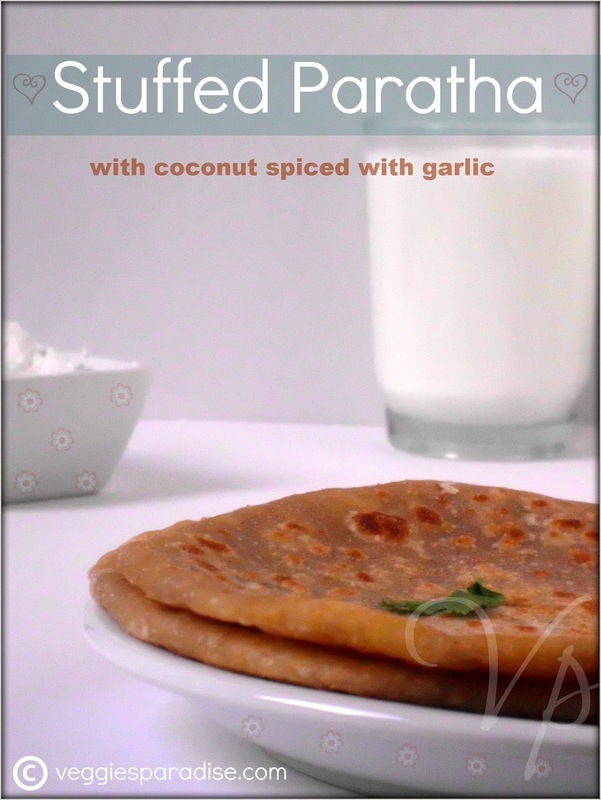 I thought it might be a sweet stuffed paratha once i saw the name, well done Aruna..excellent idea . Nice one :)its too good..
interesting recipe. would love to give it a try. very delicious and flavourful.never tried this..
loved ths spicy stuffing...very nice!! Nice variation for the stuffing.. will try it. quite innovative and yummy stuffing. love it. Yum! Love love LOVE coconut! This looks delicious! I didn't know something that looks this good could be so easy to make! Very nice and innovative filling...paratha looks super tempting dear...the clicks are awesome. This recipe looks great and something I'm going to try for sure! Super idea. 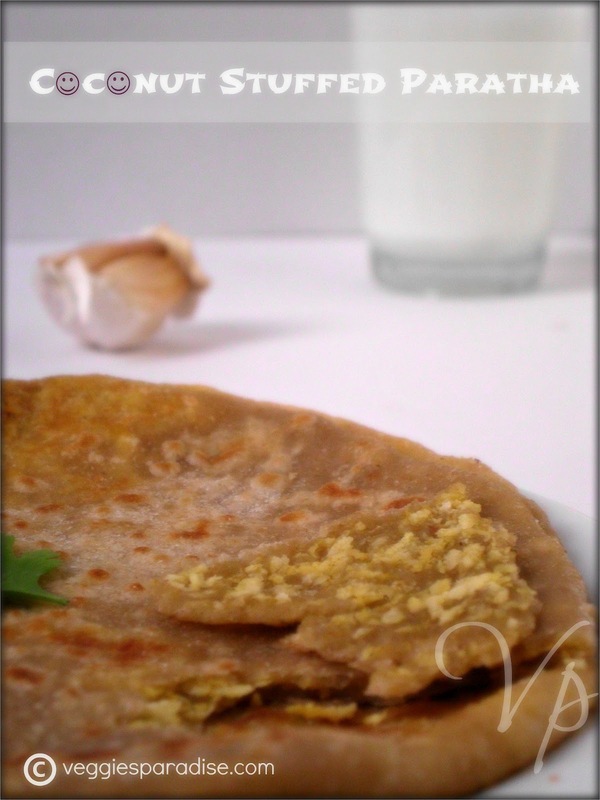 I thought of making this type of paratha with left over chutney last week. lovely presentation and nice recipe, very unique one! That is quite innovative. Never heard of it before. Looks so soft and perfect! Delicious paratha. coconut and sambar powder wonderful idea. I just had one of these paranthas at a food fair in brooklyn-- smorgasburg! it was stuffed with coconut, carrot and sambhar powder. deeelicious! Just wandering through your Blog... very nice recipes .. clean and neat photos..